Members of the Sudbury Militia and Fourth Massachusetts Regiment drilled during Muster Day at the Minute Man National Historical Park. “I don’t own a gun,” said David Nunes, a 57-year-old from Gloucester who stood in the parking lot of Minute Man National Historical Park, holding a flintlock musket he bought the week before. Amid the shouts and drums of Redcoats drilling on the Lexington-Lincoln border, Nunes explained the apparent contradiction. One week after “March For Our Lives” brought out hundreds of thousands nationwide in support of gun reform, there was a palpable sense of unease with modern politics at a recent gathering of roughly 200 reenactors practicing for Patriots Day. The state holiday, observed this year on April 16, commemorates the opening battles of the American Revolution. As far back as the 1800s — and annually since the 1970s — reenactors have been performing the battles that broke out on April 19, 1775, clutching reproductions of the guns fired that day. “Guns in those days were iffy propositions,” according to Merritt Roe Smith, a longtime American historian and professor at MIT who specializes in the history of technology. The front-end-loaded, flintlock muskets were made by hand, very inaccurate over 60 yards, easily broken, and often unreliable, even though they had already existed for a century by then, Smith said. Muskets, designed for speed, could be shot only three times in a minute. Rifles, which were the latest technology at the time and designed for accuracy, only one or two times a minute, according to Smith. Yet the Second Amendment of the Constitution, ratified just 16 years later, is at the center of today’s debate over gun rights in an era of assault-style weapons. As (mostly) men in 18th-century garb practiced last weekend for a reenactment of Parkers Revenge, one of several battles between British regular soldiers and colonial militias that day, the past and present bumped elbows, politics included. “It’s an ongoing debate in my house about whether this is a gun,” said Peter Secor, 56, from Bedford. “I’m not a gun owner. I’m not a gun owner, but I have a musket,” he said, after pretending to fire it on the troops marching down Battle Road in the bright Saturday afternoon sun. He and his fellow militiamen from the Lincoln Company pointed their guns from the steep hillside toward an empty field below, shouting “bang” to simulate the explosion of black powder there will be during the reenactment. One momentarily imitated the chatter of a machine gun with a laugh. The rule to never point a gun at anyone — and that replica muskets are guns to be taken seriously — is one the National Park Service strongly emphasizes as part of Muster Day. The event also includes firearm and uniform inspections, as well as a few dirty looks at reenactors sporting beards, an unpopular look back in 1775. The Park Service also prohibits portrayals of combatants being killed or wounded during the reenactments, although there were numerous casualties as both sides traded fire between Concord and Boston. By day’s end, 73 British soldiers and 49 colonial militiamen were dead; 215 in all were wounded. Another Park Service rule: The event is explicitly nonpolitical. Before and even during the event, some reenacting groups instructed their members not to talk to reporters about political topics such as gun rights or the Second Amendment. Some participants pointed to the fact that the amendment — and the Constitution itself — had yet to be written when the events they were portraying took place. Some participants, many of whom became involved in reenacting during bicentennial festivities more than 40 years ago, were active in lobbying against one aspect of gun control in the late 1990s. 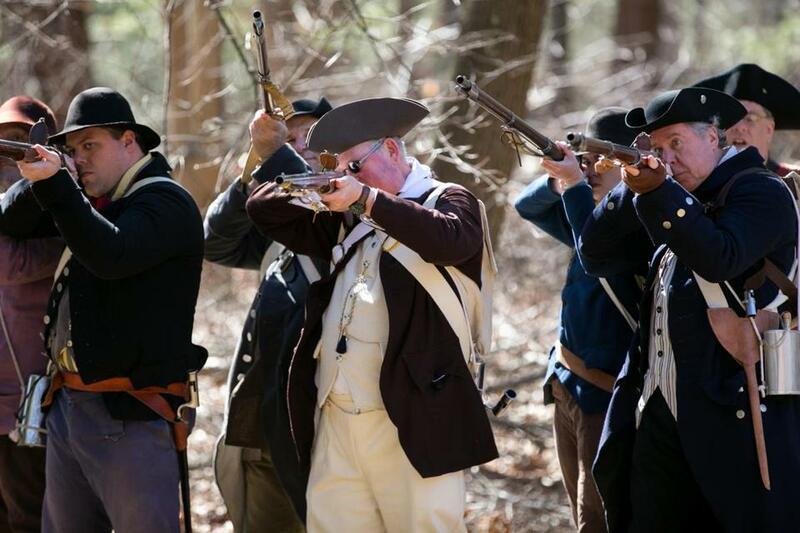 Reenactors successfully petitioned for their historic replica firearms to be exempt from safety lock mechanisms being considered by the Massachusetts Legislature for all guns, the Globe reported at the time. For some reenactors who were practicing Saturday, drawing parallels to the modern gun debates makes sense. The fighting unfolded after British General Thomas Gage ordered 700 soldiers to march from Boston to Concord to seize a cache of weapons. Alerted by Paul Revere and other riders, colonists initially resisted the soldiers on Lexington Green, then turned them back at Concord’s North Bridge. From there, it was a bloody retreat back to Boston. Though Hayward does not own any modern firearms, he said reenacting has helped him better understand the issues around them. For 68-year-old Bill Rose of Bolton, a Navy veteran from the Vietnam War who portrays a British regular officer on horseback in this event, reenactments do not provide answers to modern political questions: They ask them. “In terms of what somebody actually thinks when they leave here about the issue of firearms, I don’t know, because I’ve never asked,” Rose said.